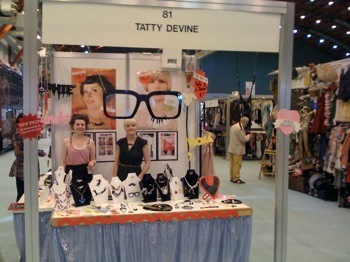 A big thank you to everyone who came to see us at the Clothes Show London, what fun it was! We decorated our stand with loads of giant jewellery, it looked amazing! We also previewed our Initial necklaces and brooches, as well as a range of necklaces which have not even come out yet! Don't worry, we will put them on our website soon. We had a visit from What Katie Wore, have you read her blog? Kirsty also found time to make a new friend, who turned out to be none other than infamous Come Dine With Me contestant Hugo! What a joy he was, the two of them got along famously! Here he is in all his Come Dine With Me splendour! What fun.